CREST Awards: Host a Discovery Day in School! CREST Discovery Awards offer an introduction to real project work and give students the freedom to run their own investigations. They can be completed in one day, with students working together in self-managed groups. Students work in groups to solve a STEM challenge, or challenges, with minimal adult intervention. Then students present their work. Students develop team-work and hands-on investigative skills. After successfully completing the project, students receive a personalised certificate. Samples of students’ work and key information are uploaded via the online platform. Discovery Awards are assessed by a teacher or group leader, usually at the end of the day. 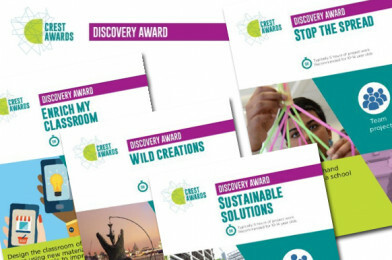 You can download ready-made Discovery Award plans from the CREST resource library. Discovery Awards are aimed at students age 11-14 and take approximately 5 hours to complete. If you are based in Merseyside or Cheshire and would like to hold a Discovery Day in your school, contact CREST North West to find out more.